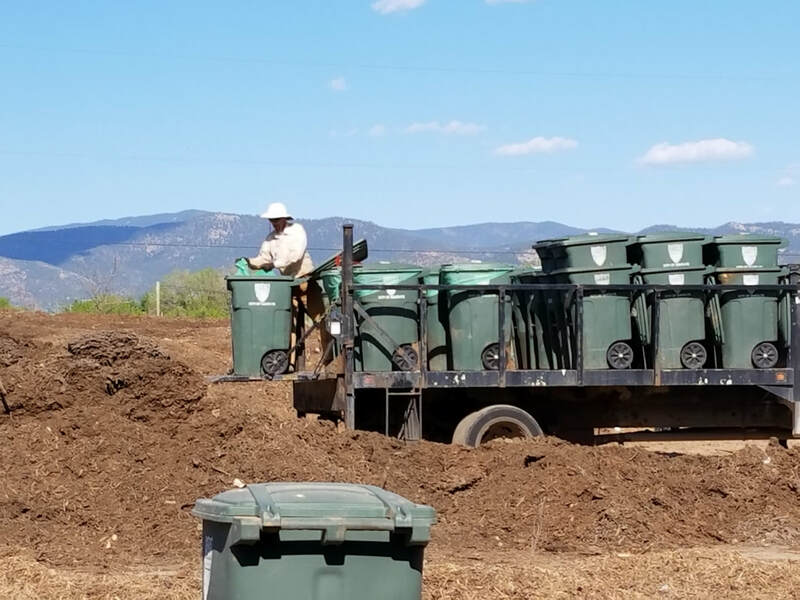 We operate a commercial food scraps collection program in Santa Fe, collecting food waste from area restaurants and schools. We compost this food waste in Aerated Static Piles to create a premium soil amendment efficiently and effectively. The impact on our community’s quality of life is immense: Reunity Resources diverts thousands of cubic yards of food scraps from the landfill where they would create toxic methane. Instead, we are using this organic material to create a rich, fertile soil amendment that retains moisture and nurtures area farms and gardens. Our goal is to make food scraps/organics separation AS SIMPLE AS POSSIBLE for our restaurant clients, and to make a seamless transition from trash to treasure! We provide bins, bags, labels and 64-gallon wheeled carts for collection. Call Trevor at 505-393-1196, Monday-Friday 9 a.m.-4 p.m. or email trevor@reunityresources.com to discuss the details of your restaurant, institution or event. We look forward to serving you. We collect used cooking oil from over 60 restaurants. We make collection as simple as possible for restaurant staff. Collection is free and participants may qualify for a tax write-off of up to $5000. This used cooking oil is processed into low-emission biodiesel and redistributed. To become a Partner in Sustainability in our BioFuel Collective, email Trevor at trevor@reunityresources.com or call at (505)-393-1196. We encourage anyone who wants to drop off their home kitchen food waste to bring it to our free collection carts during operating hours, 9 a.m. - 4 p.m. Monday through Friday. Entering our driveway, continue straight for 50 yards and you’ll see our collection bins with food waste labels. Thank you for composting! If you are having a large event and would like to deliver your source-separated food waste, please email Trevor at trevor@reunityresources.com or call at 505-393-1196. Call 505-393-1196 Monday-Friday 9am-6pm to become a partner in sustainability. ​Many thanks to these committed businesses for their donation of used cooking oil and/or participation in our food scraps collection program. Without these partners, we would not be able to do the work we do. We offer free, local, reliable used cooking oil collection and food scraps collection.